in shoeboxes that others pack. Handcrafted donations we've received for our packing parties from Chelle's CayBees. One of my 2 to 4 year old girl shoeboxes' with crafted items. 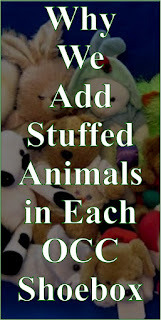 Individuals would be thrilled to have hand crafted items donated to include in their shoeboxes. We have a couple ladies who craft for our boxes and what we can't use we send as fillers thru our local drop off location. And if you don't mind shipping items, it doesn't have to be a local packer, we receive our donations from across the country (Suzanne, from Sew Delightful, in Washington State and Chelle, of Chelle's CayBees in North Carolina). If you don't know any one personally that packs, stop by one of the following Facebook pages and leave a comment letting the community know you would like to donate crafted items and your general location (unless you want to ship them). Call around to local churches to see if any of them are involved. 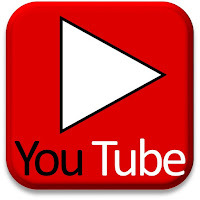 They would be able to put you in contact with someone. 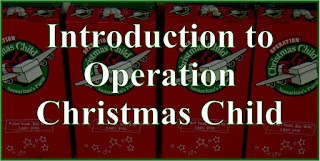 You can also contact Operation Christmas Child and ask them for the area coordinator for your district. Contact them and ask who you could donate to locally. Fifty pencil cases for our kids' packing party at church. 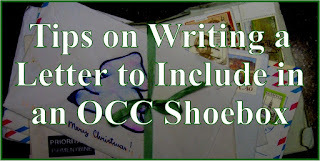 Packing OCC Shoebox Pencil Pouches. 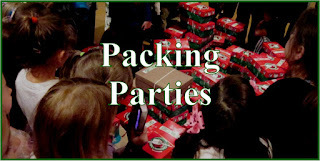 There are hundreds of packing parties each year around the country. Some packing a hundred and one I know of packs over 20,000 in one day. They all need a LOT of fillers to make it happen. They would be happy for donations. 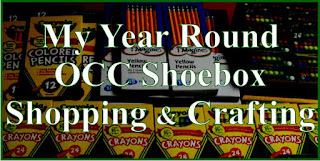 We have received many donations for our kids' packing parties. Most likely there are several in your area. Follow the steps above to find one to donate to. The week before Thanksgiving each year local Operation Christmas Child drop off locations are set up to receive shoeboxes and filler items. You can find one near you thru the link above (they are only listed in the fall of the year as they can change yearly). 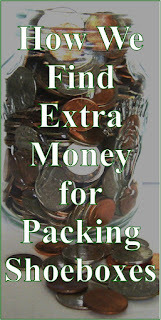 Pack your items up in any box OTHER than a shoebox, mark on the outside "Fillers" and drop off. We have done this a lot--it is really simple. We donate many hats as fillers made by ourselves and Chelle's CayBees. 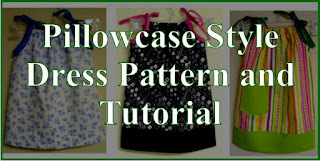 This design can be found on Joy With Purpose. 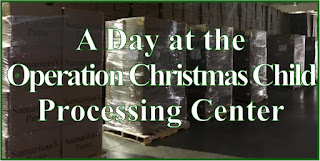 Operation Christmas Child has processing centers in Baltimore, MD, Charlotte, NC, Boone, NC, Atlanta, GA, Dallas, TX, Minneapolis, MN, Denver, CO and Orange County, CA. Volunteers check each shoebox to be sure there are no items on the "do not send" list. Often something has to be taken out, when this happens they replace it with a donated filler item. Also, many boxes come thru the line with just a couple of items. When this happens, fillers are added to help fill it out. You can drop off your hand crafted items at one of these locations. 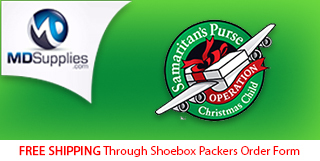 You can contact Operation Christmas Child to find out the location and hours of operation, (828) 262-1980. We also make a lot of tote bags -- both these library bags and drawstring bags. 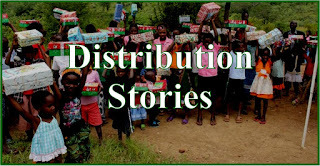 Operation Christmas Child requests Gifts-in-Kind from large corporations, but they don't always receive enough to help fill in the gaps in some of the millions of shoeboxes they process each year. They have requested on their Facebook page for hand-crafted items. You can see more about gifts-in-kind requests here: Operation Christmas Child Gifts-In-Kind Opportunities. 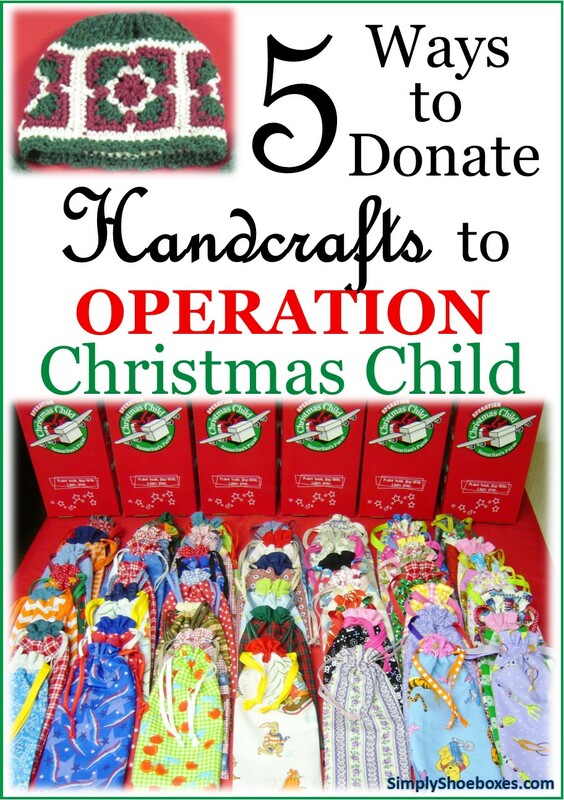 Almost anything you like to craft can be donated, but remember, the items need to be small. I would suggest aiming for no larger than the approximate size of a quart jar of mayonnaise. That way it easily fits in an average sized shoebox with room for other items. For instance if you want to make small blankets, when rolled up tightly and tied with a ribbon it should be about that size, the same with a hat & scarf set or a stuffed animal around that size. 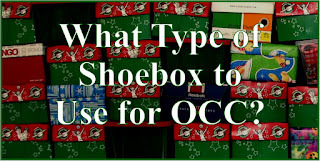 OCC Shoeboxes are divided into the following ages: 2 to 4 year olds, 5 to 9 year olds and 10 to 14 year olds. So items appropriate for any of those ages can be donated. Matching memory game made from scraps of fabric. 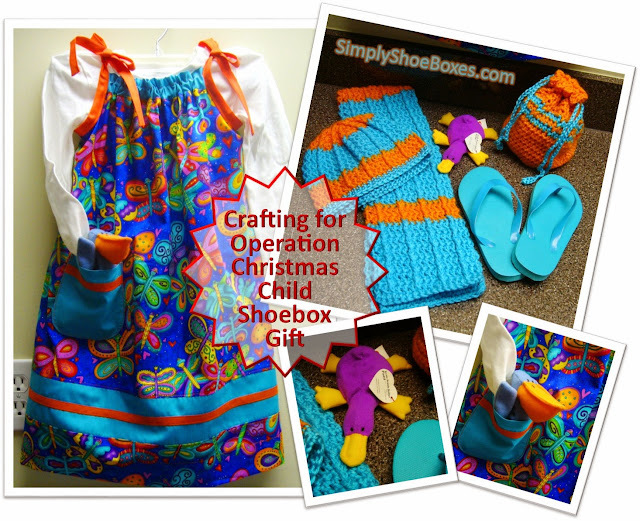 For ideas on what to make, check out our Crafting for Operation Christmas Child Shoeboxes index post. 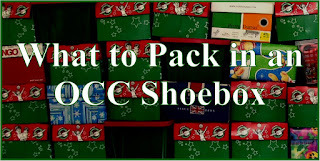 And please remember, shoeboxes do need to be packed or there will be none to send to the children--so don't stop packing shoeboxes to send fillers; if you already pack, keep packing and if you'd like, send extras as fillers. This post was written with the USA Operation Christmas Child collections in mind, but the same should work in your country. 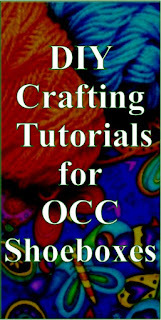 Check with your local country's OCC headquarters for more information. Just wanted to add a little to the size suggestion. If you're choosing a size to make, remember it's going to need to fit into a shoebox, ideally with room for other things too. But if you happen to have larger items (large but still small enough to fit into a large-sized shoebox), go ahead and send those for use as fillers too. Sometimes there are large shoeboxes and even boot boxes that need fillers added, and large items are good for those. Good point, Mark. Those really large boxes that need extra could use some larger sized items. Thanks.